Return of the Killer Tomatoes! – Crazy old Professor Gangreen has developed a way to make tomatoes look human for a second invasion. This was a random pick in the horror section, picked while recording the last episode, which has made us rethink our picking process. This was far from horror, and far from comedy, but it was one of George Clooney’s first acting gigs. Pour yourself a strong drink and listen in as we peel it apart and chop it up, just like a tomato. 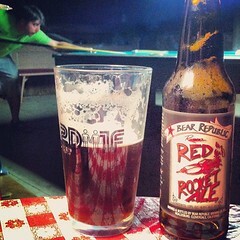 This episode is sponsored by Dawn-a-pa-Drew-za 5.0 and the beer we’re drinking is Bear Republic’s Red Rocket Ale.